This is, perhaps, a strange category for this fish-laden Austin Sushi News report, but, especially in this age of over-fishing and mercury contamination, there is a place for our vegan brethren. And, I must say that, it's pretty hard to find high-quality vegan food in Austin. Sure, I dig Casa De Luz and Veggie Heaven on occasion, but the recently opened Daily Juice Cafe at 45th and Duval has an amazing vegan sushi roll on their menu called the Daily Sushi. The roll consists of "pumpkinseed pesto, coconut strips, shredded carrots, avocado, red bell pepper, and sprouts rolled in a crisp nori sheet and served with ginger-wasabi dipping sauce." Now that's good eatin' ! Bad economic times never seem to stop the flow of sushi into our faces, and, notwithstanding the proportions of this economic bust, some new sushi is on its way. The AustinSushi.com team took a stroll over to Maki, the latest spin on "fast" Japanese food, and was mightily impressed by this new Austin operation. They are, essentially, a roll-your-own sushi roll bar where you walk up to a counter, point at the ingredients you want, and the person behind the counter (not a sushi chef) makes the requested roll. 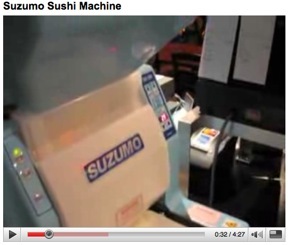 In order to speed up the delivery time and lower employee costs, they utilize a sushi robot, specifically the Audio-Technica ASM 860, that spreads the rice onto the nori. This allows for relatively unskilled labor to complete the roll. The place has a noveau fresh ambiance with a pleasant lime green color and spiffy graphics on the wall. It's definitely "fast" food and not a sushi bar, but still a great place to get a sushi fix when you need something fast that's well-prepared. Read more about Faster, Stronger, Better? The notorious DK has apparently revved-up his sushi making machine, and is offering classes on a weekly basis (every thursday and saturday) at very affordable prices. Meanwhile, Andrew "Kiniakua" Grambusch is now offering catering and classes as "Sushi Anyone?". From the looks of his photos, he has some chops. 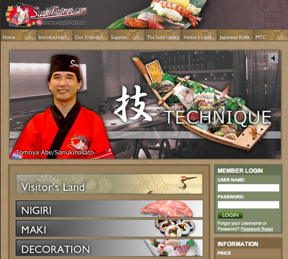 Husband and wife team, Take and Kayo, owners of delibento.com, also offer sushi catering and classes. Check out their "Little Rollers" class for kids!